There have been many classic point-to-point road races held over the years and several of them lasted for a long time before being lost. A change of course in any race that is a feature of the athletics calendar is regretted but the consolation is that the race itself is still in existence. When a real classic disappears altogether then it is, to all runners, a tragedy: there is always the feeling that we are not keeping faith with past generations who promoted it, but even more that we will never have the chance to run in it ourselves. The race from Perth to Dundee was just such an event. Competitors included Olympic athletes, British and Scottish marathon champions and British and Scottish internationalists. We are indebted therefore to Alex Wilson for this account which is the result of a great deal of research and represents an abridged version of his own complete account which may see the light at some point in the future in book form. Alex would like to acknowledge the assistance from Roy and Barbara Robertson – Charlie Robertson’s son and daughter-in-law. NB: Alex Wilson has also done a post script covering the last two races in 1981 and 1982. In 1942 the Allies began to strike back at Hitler’s Nazi War Machine, and for the first time in three dark bitter years of War a ray of hope began to glimmer through the gloom. When the USA finally joined the Allied effort, Britons began to sense that the War was beginning to turn in their favour. With few exceptions, organised sport had been in a state of limbo since the outbreak of hostilities in 1939. A notable exception was the Polytechnic marathon in war-torn London where the remarkable Polytechnic Harriers continued defiantly to stage their annual marathon race. In their programme, however, the made sure to inform entrants to the fact that in the event of an air-raid warning the event would be cancelled at short notice. The Nazis were intent on crushing the heart of industrial Britain and had begun carpet-bombing big cities like London, Coventry and Birmingham, but they had also started targeting Clydebank with its ship-building industry. For the most part however Scotland was a haven from aerial attack. Famous Scottish marathon runners Donald McNab Robertson and Duncan McLeod Wright, on home duty, kept themselves race fit despite rationing. In Dundee the talented Jimmy Brannan set up a cross country league which was well attended by Servicemen from the local Army training camps. In 1942 Brannan came up with the idea of recreating the old Perth – Dundee race which had first been run in the late nineteenth century. The event ironically was made possible by the War! Strict petrol rationing had transferred the main Perth – Dundee highway into a quiet country road. But there was another key factor: the destruction of the Dundee Thistle Harriers clubhouse in Abbotsford Road by the Luftwaffe in 1940. These circumstances, and a concomitant shortage of manpower owing to enlistment, forced the homeless ‘Thistle’ to make a virtue out of necessity and amalgamate with inter-city rivals Dundee Hawkhill Harriers creating Dundee Harriers. Collectively and with considerable ingenuity under the auspices of Jimmy Brannan, the Dundee Harriers inaugurated the Perth – Dundee marathon. It has the distinction of being one of the very few events in Britain to have come into being during World War II. For thirteen years the race would be a major fixture on the Scottish Marathon Club calendar, attracting the finest distance running talent from Scotland and further afield. The Perth – Dundee marathon flourished during the war years but did not survive peacetime for long. The 1950’s brought increasing prosperity to the region with the result that the A90 between Perth and Dundee became a busy arterial route no longer suitable for running races. This is the story of a long-forgotten piece of Scottish Athletics history. 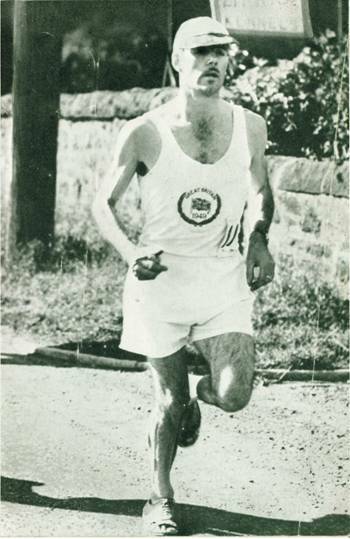 Charlie Robertson (Dundee Thistle Harriers) Won the Race No Fewer Than Five Times. It all began back in 1894 when a footrace from Perth to Dundee was held by Dundee Hawkhill Harriers. The winner was James M Galloway. He covered the 21 miles 1540 yards course in 2:20:00 to finish 25 minutes ahead of second-placed James B McNair. Of course there was no such thing as a marathon in 1894 and, indeed, it was only in retrospect that the inaugural 1894 race was referred to as a ‘marathon’ – as many races of 10 miles and over were commonly known pre-1945. In 1944 the famous Dunky Wright won 12 of the 114 marathon fixtures of the recently established Scottish Marathon Club. Not one of these fixtures was actually over the regulation distance, the longest being the Perth – Dundee 22. Interestingly, while the inaugural Olympic Marathon in 1896 was about 25 miles, and today of course the marathon is 26 miles 385 yards, the actual distance from the ancient battlefield of marathon to the Greek capital of Athens is around 22 miles. This, according to the Greek legend was the route taken by a foot courier to bring news of the Athenian victory over the Persians in 490 BC. So, strictly speaking, the Perth – Dundee was actually closer to the legend! After Galloway’s inaugural run, a series of walking matches from Perth to Dundee were held about the turn of the century. A lapse then occurred until about 1930 when the Dundee Hawkhill Harriers, prompted by Galloway who was by then on their committee, staged a series of walking matches which attracted large fields from 30 to 70 strong. Galloway’s two sons, Scottish and AAA’s champion, George and Alex between them won five out of the six events. Again there was a lapse until 1942 when Dundee Harriers captain Jimmy Brannan launched an attempt on Galloway’s ancient record. A writer characterised Brannan as a “restless, erratic, yet likeable, genius”. He had been a promising young runner and in 1931 had been selected as a reserve for Scotland at the ICCU International Cross-Country Championships after finishing twelfth at the Scottish National Championship. However Brannan disappeared from the athletics scene soon after that and nothing was heard of him until 1940 when he made a comeback. Finding the united Dundee Harriers in a state of disarray, he brought his considerable organisational skills to bear , enlisting local service units and setting up an eastern cross-country league. In 1940 German bomber planes dropped bombs in the Blackness Road area in Dundee, one of which obliterated the Abbotsford Street clubrooms. This came as a hard blow to the Thistle Harriers’ club which was already losing its young runners to the Forces. City rivals Hawkhill Harriers were facing similar woes. In an unprecedented move, the remnants of the Thistle and Hawkhill Harriers clubs amalgamated under the name of Dundee Harriers. Thanks to this initiative, Dundee Harriers was the only functioning Harrier club in the East of Scotland in the Second World War. After the War, the ‘Hawks’ and the ‘Thistle’ went their separate ways again and the ‘Thistle’ rebuilt their clubhouse in Abbotsford Street. From 1946 onwards a joint committee comprising members of both clubs shared responsibility for organising the Perth to Dundee Marathon. In 1942 Brannan turned his attention to marathon running and decided it was time to revive the legendary Perth to Dundee. This he accomplished despite considerable difficulties in obtaining resources. Brannan galvanised the support of the amalgamated Dundee Harriers which at that time was under the auspices of DM Thompson, President of Dundee Harriers. Thompson as race convener was pivotal in the success of the 1942 and 1943 races. Through Brannan’s influence, Dundee Express Deliveries household removals firm donated a handsome perpetual trophy which the named ‘The Dundee Express Trophy’ and was to be awarded to the first competitor to finish the course. In 1943 a second perpetual trophy, the ‘Owens Trophy’ was sponsored by J Owens, Esq, and awarded to the first Angus competitor to finish the course. Placing, handicap and special awards were provided by the Dundee Harriers. However Thompson was directed south on war work in the autumn of 1943 and thus ended his involvement with the race. With the fixture now gaining momentum, the 1944 race attracted a record entry and was organised jointly by Brannan and Alex Mudie. The task of organising the race eventually fell to PD Henderson after Brannan’s retirement from competitive athletics. Official race programmes were printed and distributed. Among those responsible for their proliferation was Chick Haskett, father of 2:18 marathon runner Charlie and a nephew of Scottish cross-country international and NCCU President Alex Donnett, who acted as timekeeper. The revived race was held over the original 22 mile course with the competitors covering an extra furlong more than Galloway did forty eight years earlier. The start was at South Inch Park in Perth. From here the course went along Shore Road and swung right across the River Tay by Victoria Bridge (demolished in 1960 and replaced by the Queen’s Bridge), an on to the main Perth to Dundee road continuing via Glencarse, Longforgan and Invergowrie to Ninewells. After the tram terminus at Ninewells, the route forked right down to Riverside Park and went past the Tay Rail Bridge to the finish, situated by the drinking fountain at the east end of Riverside Drive. In the 1946 programme, the course was described as ‘level practically the whole way’ and ’eminently suitable for fast times’. In actual fact, competitors had to negotiate two tricky inclines in the latter stages of the race, these being “Snab’s Brae” from Inchure to Longforgan at around 15 miles, and the uphill section to Ninewells at around 18 miles. It was without doubt a scenic route set against the rolling Sidlaw Hills to the North and the River Tay to the South. The smooth running of the race was in no small part dependent on a closely co-ordinated team of dedicated volunteer helpers, marshals, and officials. And with the added difficulty of the distance involved and the race being a ‘point to point’ course, timing and logistics were critical to success. The minor matter of changing accommodation for instance was provided by the Queen’s Barracks in Perth. Of course the race officials and the runners’ belongings had to be transported from Perth to Dundee without hitch. In this regard the organisers were indebted to Dundee Express Deliveries who always contrived, even during the most difficult days of the war, to place transport at the disposal of the organisers free of charge. As befitted a race of this distance, refreshments were provided at the check points along the route and intermediate times taken. The timekeepers had their work cut out keeping intermediate times for the leaders and the pursuers, especially as sizable gaps began to emerge, and they would be seen rushing frantically from point to point in their car. Several cars and numerous cyclists always accompanied the runners through the Carse of Gowrie. 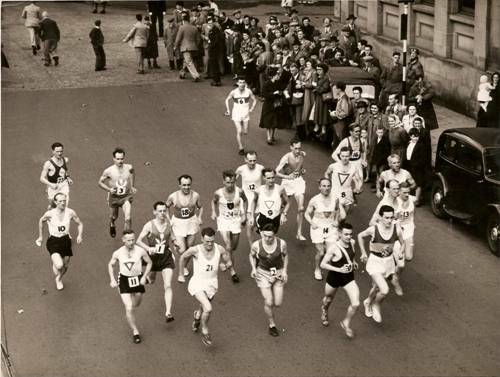 The inaugural race of 1942 attracted only a handful of competitors but nevertheless was hailed as a success after world famous marathon runner Donald McNab Robertson clipped over 14 minutes from Galloway’s timeworn record. Despite having no rival to keep him on his toes in the latter stages of the race, Robertson gave an impressive display of sustained front running to cover the 22 mile course in 2:05:51. Jimmy Brannan was second in 2:10:37 and Jock Lindsay (Bellahouston Harriers) third in 2:18:48. A former protégé of Dunky Wright , Donald Robertson was a six-time winner of the AAA marathon. From 1930 until the outbreak of war in 1939, Donald Robertson and Dunky Wright dominated the AAA’s marathon winning between them all but two titles. Robertson had been chosen to represent Britain at the Los Angeles Olympics in 1932 but turned down the invitation to look after his mother. Selected again as British champion four years later Donald ran at the Berlin Olympic Games where he finished seventh. Donald also represented Scotland twice at the Empire Games placing fourth in 1934 and second four years later in Sydney. Winning the British championship in 1939, he had been bound for the abandoned Helsinki Olympic Games of 1940. The course for the 1943 race was extended to the regulation marathon distance for an ambitious assault on Harry Payne’s British Record of 2:30:57.6. Donald Robertson and Tom Richards, among others, were invited to participate. Unfortunately no amount of planning could have foreseen that Donald Robertson would contract a chill and be unable to run. Local favourite Jimmy Brannan deputised for the indisposed Robertson, but collapsed dramatically after 15 miles. With no one to push him, the Welshman ran out an easy clear winner in 2:44:13. Richards was followed home by two Maryhill Harriers runners – the tall, bespectacled figure of Andy Blair second in 2:50.4, and Andy Burnside third in 2:52:10. Sadly this was to be Blair’s last race. A glazier by trade, he fell to his death the following month while working on the roof of Singers’ sewing machine factory in Clydebank. When the Scottish Marathon Championship was inaugurated in 1946, a perpetual trophy named in his honour, the ‘AH Blair Trophy’ was awarded to the winner to hold for a year. Although Richards winning time was a long way off the British record it was easily the fastest marathon time posted by a Briton during World War II. Brannan it was later revealed had been running against his doctor’s orders, having been ill with the ‘flu. He never fully recovered his health and died suddenly four years later aged 39. The creators of the 1944 programme couldn’t resist poking fun at the Nazis. the cartoon on the cover shows a cigar puffing Winston Churchill, FD Roosevelt and Joe Stalin running side by side en route to Berlin with Adolf Hitler training behind, well beaten. A real gem! The 1944 event was again held over the traditional 22 mile course. On this occasion it was the turn of another Scottish marathon running legend, Dunky Wright, to have his name engraved on the winner’s trophy. The 1930 Empire Games champion was in the twilight of a long career spanning four decades, but even at 47 was a force to be reckoned with. It proved a close race but Wright had the upper hand, winning from Richards by over 300 yards in 2:11:07. Wright’s club-mate, Gordon Porteous, finished third in 2:1425. Porteous was a solid, if not outstanding, club runner during his younger years. He really came into his own after turning sixty when he set a world marathon M60 record of 2:51:17 to win the inaugural world veterans championship in Toronto. 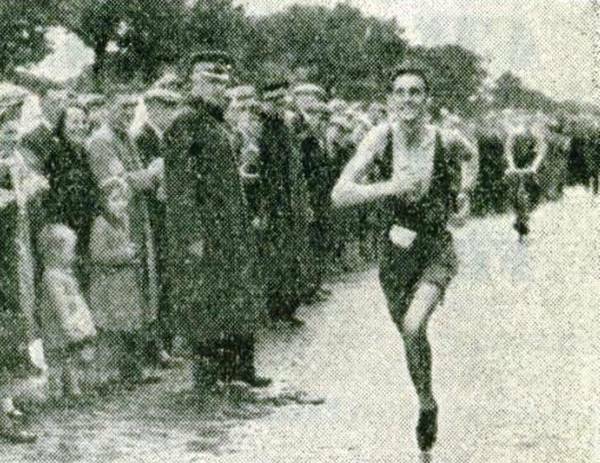 Wright retained the title in 1945, winning by seven minutes from Willie O’Connor (Shettleston Harriers) in 2:09:37. Gordon Porteous again finished third. The picture is of Dunky receiving the Trophy in 1945. The 1946 Perth to Dundee was the last big road race of the season. It was also the last in the long and illustrious career of a certain Duncan McLeod Wright. Only 15 days shy of his fiftieth birthday, Dunky was still a threat and looking to score a third victory and thereby win the Dundee Express Trophy outright. However despite running his fastest time for the course, he had to settle for second behind his club-mate Emmett Farrell who gave an inspired performance to lower the course record to 2:04:43. The 1947 race marked a return to Tayside for Donald McNab Robertson. The five-time AAA’s champion had a real challenger in the up-and-coming Charles D Robertson, a Dundee arts student representing the promoting Thistle Harriers club. However the elder of the two Robertsons lived up to his role as favourite, breaking away from his younger namesake three miles from home to win by a quarter of a mile in a course record of 2:03:25. This map, drawn by DM Bowman (Clydesdale Harriers), shows the route of the 1948 Perth – Dundee Marathon which hosted the Scottish Marathon Championship for the first time. David Bowman drew the maps for all the Scottish Marathon Championships up to and including the 1970 Commonwealth Games Marathon. He was meticulous about detail and usually included water points, sponge stations and five mile points. he often had an insert with the contours showing the location and severity of gradients on the course. In 1948 the organisers were invited to host the Scottish Championship so the course was again extended to 26 miles 385 yards by moving the start further westward to a point on the Methven Road. Local hero Charlie Robertson was not to be denied and won by over half a mile from Emmet Farrell in 2:45:12. As reward for his efforts, Robertson took home no fewer than three trophies together with his winner’s medal. 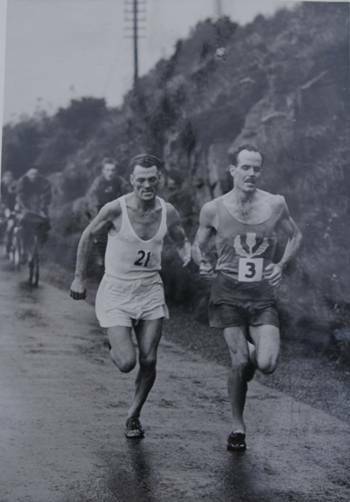 The 1949 race reverted to the traditional 22 miles route and Charlie Robertson defended his title in emphatic style, winning from Gordon Porteous by nine minutes in 2:05:49 – the biggest winning margin since the inception of the annual race. Bob Fail (Gosforth Harriers) who finished third in 2:16:44 was the first of the English runners to participate. Robertson was actually on course for the record until a few miles from home but lost ground in the closing stages on account of the unseasonably warm weather. A notable performance was that of the 64 year old Australian veteran Stewart Vance who was visiting Britain. Last at one stage he pulled up to tenth and collect the handicap prize. Donald McNab Robertson was conspicuous by his absence. A couple of months earlier the Scottish distance running fraternity had been shaken by his death, from a thrombosis, at the age of 43. The 1950 race was held in torrential rain with surface water making the going difficult in some parts of the course. However Charlie Robertson was unstoppable and achieved the impossible – breaking the course record by a second. Flooding at Invergowrie forced Robertson to tiptoe precariously along a narrow dyke to avoid having to wade through knee deep water! Again his winning margin was huge – a full six minutes. Having clinched the crucial third victory that had eluded Dunky Wright, the Newport runner became the new owner of the coveted Dundee Express trophy. The race is in the pictures below with the trophy: click on them to enlarge them. The 1951 Perth to Dundee race was a much closer affair and in terms of quality the best so far. Robertson continued to go from strength to strength and was looking for a fourth win but reigning Scottish Marathon Champion Harry Howard and Bill McMinnis (Sutton Harriers) had other ideas. McMinnis, a PE instructor at RAF Padgate was a recent winner of the Liverpool Marathon in 2:37:40. As expected the race turned out to be a three way tussle between Robertson, Howard and McMinnis. At one point it looked as though Howard would have his way but Charlie Robertson pulled out all the stops on the long incline to Ninewells to win narrowly in yet another course record – 2:01:41. Howard (2:02:13) and McMinnis (2:03:47) also finished inside the old record figures in what was the classiest race so far. It is fair to say that on this occasion it was local knowledge that tipped the balance slightly in Robertson’s favour! The young St Modan’s runner, Joe McGhee, a star of the future in the making, clocked 2:09:41 but that was only good enough for sixth place. Charlie Robertson overtakes Howard on the climb up to Ninewells. The 1952 race was again over the full regulation distance for the last time. For the second time, the Perth – Dundee Marathon would host the Scottish Championship. Charlie Robertson was the firm favourite after lowering Dunky Wright’s Scottish record to 2:30:48 in the AAA’s marathon. He had narrowly missed out on selection for the 1952 Olympics and therefore was back challenging for a fifth win. However, Anglo-Scot Jock Duffy of Hadleigh Harriers gave the champion more than he bargained for and provided the most exciting finish in the history of the race. Robertson was, by his own admission, a little short of training and ran himself literally to a standstill, coming to an exhausted stop only half a mile from home with the determined Duffy breathing down his neck. However just as Duffy was about to pass, Robertson got going again, and, summoning his last reserves of energy sprinted home to clinch his third Scottish title in 2:38:07. Duffy, a bricklayer hailing from Broxburn, brought home the runner-up plaque in 2:38:32, finishing two minutes two seconds ahead of third placed Emmet Farrell. There was an English invasion in 1953 and in the absence of Robertson, who was in semi-retirement from the sport, Eric Smith (Leeds Harehills Harriers) outpaced Joe McGhee in the closing stages to win by 19 seconds in a course record of 2:01:13. Alan Lawton, also of the Harehills club, was third in 2:02:40, while Alex Kidd (Garscube Harriers) found 2:05:42 only good enough for fourth. *but the demise of the race had to do with the fact that Dundee Thistle Harriers were themselves in terminal decline. The ‘Thistle’, according to Charlie Robertson’s son Roy, had become too road-oriented and as a result had been having difficulty recruiting young athletes, who instead were flocking to city rivals, Dundee Hawkhill Harriers which had a stadium and cinder track at Caird Park. Thus ended an historic race series graced by several of Britain’s best marathon runners of the 1930’s, 1940’s and 1950’s. On 5th July, 1981, after a 27-year hiatus, the Perth – Dundee road race was resurrected in conjunction with the Dundee Highland Games. By then, all but senior or at best middle-aged Dundonians, would have lost any recollections of the footraces held in the 1940’s and 1950’s. Who was the instigator? A senior member of the Hawks? Or maybe it was Games Secretary and organiser John McGuire? Perhaps a reader will care to enlighten us. The race was run over an advertised distance of “about 22 miles” between the two cities. The route started at the North Inch, Perth, and was mainly on the dual carriageway. After reaching the outskirts of Dundee, the runners swung left up the Kingsway to the finish at Caird Park, concluding with a lap of the track. The course therefore was slightly different to the old one – and evidently a little longer too. Details are sparse, but it is known that around 40 runners took part and Sam Graves of Fife AC was first home in 2:18. Indeed Google Maps indicates the distance to be something over 23 miles. The revival race was certainly deemed a success given that it was repeated the following year. The 1982 event attracted almost double the number of entrants, 75 in all taking part. Despite the high number of local entrants, it was an Irishman based in England who produced the best performance of the day, coming home in 2:17:05 to claim the £40 first prize (a voucher – not cash!) and teh Barnett Trophy. Peter Mitchell, of Reading AC overcame wet and blustery conditions and still looked full of running when he reached the tape after a circuit of the Caird Park track. He had enjoyed an excellent battle with Murray McNaught, from Fife Athletic Club, who led the race most of the way. Murray, who finished 15 seconds later, took his defeat in truly sportsmanlike fashion and was among the first to congratulate the winner. The next places were filled by Brian Kirkwood (Edinburgh AC), third in 2:18:13, Peter McGregor (Victoria Park) fourth in 2:21:14, the previous year’s winner Sam Graves, fifth in 2:21:14 and D Walker, sixth in 2:30:32. In addition to the prizes, there was a finisher medal for each contestant who completed the course. It is not known who the first woman was, or indeed if there were any women competing, but there was a woman’s prize of £10 on offer. It will be noted that in 1982, gender equity in sports prize money was still a thing of the future. The Courier reported that only 3,500 spectators braved the elements at Caird Park, where in addition to seeing the finish of the road race, they witnessed an exciting “heavies” contest featuring British Shot Putt record holder, Geoff Capes. The race was almost certainly abandoned thereafter, be it due to the policing problems or the organisers. The 1981 and 1982 races brought the total number of runnings to 16 (1894, 1942 – 54, 1981 – 2) and that is how it still stands today. It remains to be seen whether we will ever see a resumption of this classic intra-city footrace in any shape or form.